Former President, Dr. Goodluck Jonathan, Monday, prayed the Abuja Division of the Federal High Court to set aside the subpoena it issued to compel him to testify as a witness in the ongoing trial of former National Publicity Secretary of Peoples Democratic Party, PDP, Chief Olisa Metuh. Jonathan and Metuh Dr. Jonathan, in a motion he filed through his counsel, Chief Mike Ozekhome (SAN), urged Justice Okon Abang to set aside the subpoena ad testifiandum he issued against him on October 23. In the alternative, the former President asked Justice Abang to direct Metuh to deposit with the court, for and on behalf of himself, N1 billion in line with provisions of Section 241(2) of the Administration of Criminal Justice Act, 2015. He said the N1 billion will cover travelling expenses for himself and his security personnel from his home town, Otuoke in Bayelsa State, to Abuja and also for time that he might spend appearing before the court as President of Nigeria between 2010 and 2015. Jonathan's lawyer, Ozekhome (SAN), maintained that the evidence Metuh is seeking will amount to an invasion of his client's personal right to privacy, and family life as provided for in Section 37 of the Constitution of the Federal Republic of Nigeria, 1999. In addition, he submitted that the evidence sought to be obtained from Jonathan was likely to expose the former President to a criminal charge, penalty or forfeiture. He further argued that the subpoena was vague, applied for and obtained on frivolous grounds and in bad faith, saying it was meant to embarrass the person of the applicant. Besides, Jonathan argued that Metuh was not a personal aide or his appointee and, therefore, could not have dealt with the President directly under any circumstance to warrant the invitation of the applicant to testify in the charge. He further submitted that there was no nexus between him and Metuh and the charge for which the defendants are standing trial. The case The court had, on the strength of an application by Metuh, who is facing seven-count corruption charge alongside his firm, Destra Investment Limited, summoned both Jonathan and Dasuki to appear before it. 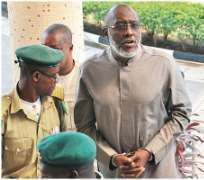 Metuh had, in defence of the charge against him, maintained that the former President and ex-NSA, were “very vital and crucial witnesses” in the matter. EFCC had in the charge before the court alleged that the former PDP spokesman had before the 2015 presidential election, received N400 million from the office of the National Security Adviser without executing any contract.